The day commenced with a Science Breakfast hosted by Mars, Incorporated. The breakfast centred around a discussion with a panel on the issue of “How Can Science Drive Solutions That Better Use the Planet’s Resources?”. 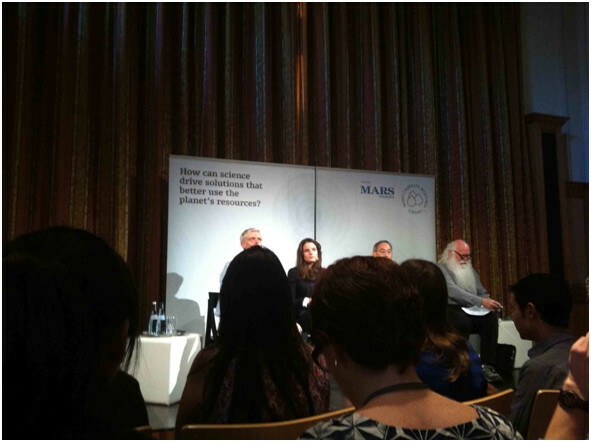 The panel consisted of Steven Chu (Physics, Stanford University), Howard-Yana Shapiro (CEO, Mars, Incorporated), Adam Smith (Editorial Director, Nobel Media) and a young researcher attending the meeting. The discussions centred around the role that scientists play in this drive to better solutions and issues were discussed including how hard it is to decide to get hired in a field which you have no previous experience, and the lack of opportunities to gather minds from all around the world to tackle these problems. On the other hand, we also briefly touched on the topic of trying to get non-scientists open to change, especially if a cleaner alternative was not cheaper or more efficient than what they currently use. Following the breakfast, there was a series of lectures from Aaron Ciechanover, Erwin Nehr, Jean-Marie Lehn, Ada Yonath, Rudolph Marcus, Richard Schrock and Robert Grubbs. 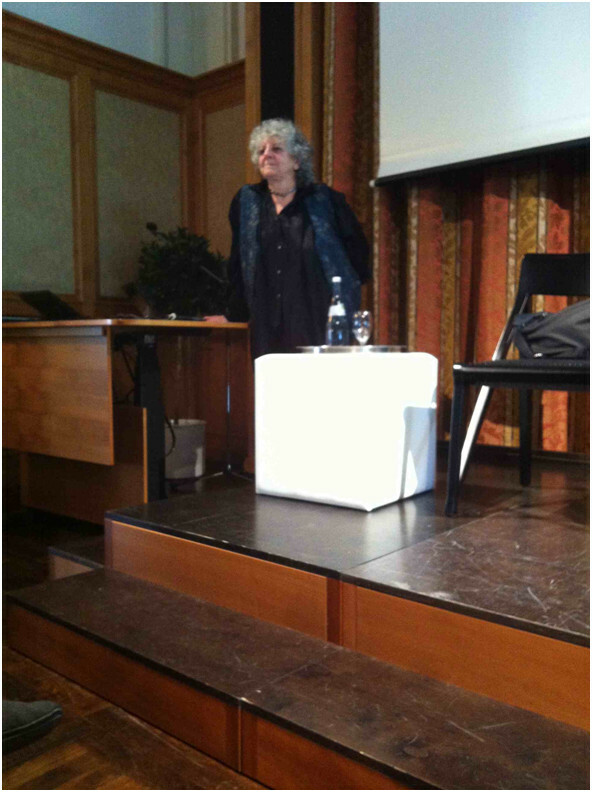 A range of topics was covered but the standout of the morning was with Ada Yonath’s talk. 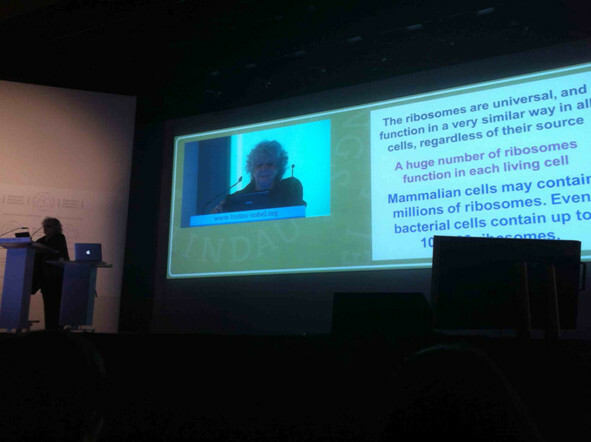 For those of you who don’t know, Ada Yonath got the Nobel Prize in 2009 for “for studies of the structure and function of the ribosome” along with Venkatraman Ramakrishnan and Thomas Steitz. In her talk Ada explained the process of ribosomes and showed videos that her group had made to explain the how they work (one of them is here). Her talk was done in such a way that it was easy to understand for people with very little knowledge of the field. However, what really moved the audience were her comments regarding women scientists. Ada talked briefly about that as a woman scientist you can have a family and be a scientist, however even though it may be hard you will find a way if you love science and your family. She was careful to stress that she wasn’t talking about women in science and that what she was telling us was of her own opinion. In the discussion that followed in the afternoon, Ada proved quite a character with the way that she answered questions. It’s a little bit hard to explain but she thinks a lot differently about things than the rest of us. Ada also elaborated on her science with ribosomes further, explaining how a bicycle accident that led to her being in hospital for approximately nine months (and missing the start of a project) and how she ended up pursuing the problem of how to crystallise ribosomes. She found the inspiration for the novel technique used to study the ribosome structure, cryo bio-crystallography, from ribosomes in polar bears that could survive the harsh conditions of winter and retain their functionality by stacking against the cell wall. The observation of the ribosomes from hibernating polar bears led to the study of ribosomes surviving in other harsh environments before the eventual development of the technique some years later. The afternoon also consisted of a brief lecture on applying for funding in the European Union before an academic dinner with the Bayer Science and Education Foundation. The Bayer Science and Education Foundation paid for my conference fee for the 63rd Lindau Nobel Laureate Meeting and this was a dinner to meet other fellow researchers and representatives, including the CEO, of the foundation. The young researchers funded by the Bayer Science and Education Foundation all presented posters related to our research. I was the only physical chemist in a room full of biologists (as the company is more pharmaceutically orientated) but they were more than happy to hear about my research.